Singapore's Paya Lebar Airbase is currently hosting United States Marine and Air Force AV-8B Harriers and F-16 Fighting Falcons for a Commando Sling exercise. 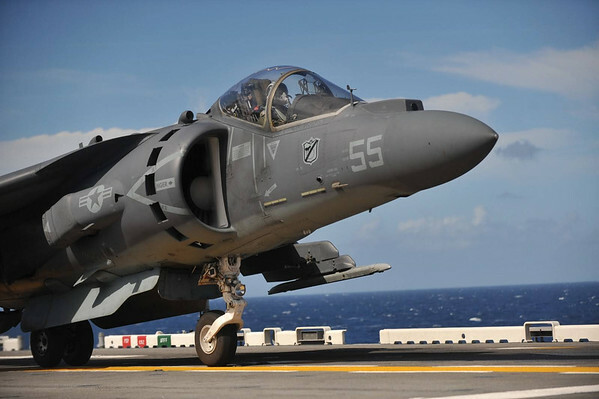 The Harriers are drawn from Marine Attack Squadron 214 (VMA-214), more famously known as the Blacksheep, and are currently attached to the Red Dragons of Marine Medium Helicopter Squadron 268 (Reinforced). HMM-268 (Rein) is the Air Combat Element of the 11th Marine Expeditionary Unit (11th MEU) on board the USS Makin Island (LHD-8). Eyes on the ground have reported that the USAF F-16s taking part are from the Flying Fiends of the 36th Fighter Squadron, 51st Fighter Wing normally based at Osan, South Korea. The Republic of Singapore Air Force (RSAF) will be represented by its F-5S/T Tiger IIs, F-15SG Strike Eagles and F-16C/D Fighting Falcons. USS Makin Island is currently on a port visit to Changi Naval Base, Singapore. In addition to the Harriers taking part Commando Sling exercises in Singapore, embarked 11th MEU Marines will also be taking part small unit subject matter expert exchanges and training in an urban environment with the Singapore Armed Forces. The Makin Island Amphibious Ready Group, which also comprises of the USS New Orleans and USS Pearl Harbor, is currently on a seven-month deployment to the Western Pacific and Middle East. The annual Commando Sling series began in 1990 to provide combined air combat training for United States and Republic of Singapore Air Force combat aircraft units. Pilots on both sides hone their skills in various scenarios ranging from one-on-one dogfights to advanced Air Combat Manoeuvring (ACM) missions involving multiple aircraft and mixed flights over the South China Sea. The exercises enable air force units to sharpen their air combat skills, improve procedures to conduct air operations at a non-U.S. base, and enhance partnerships between participating air forces and nations. Assuming my memory has not failed me, this is the first Commando Sling since the mid-to-late 1990s that have involved a Marine Harrier unit, and is also the first 3-cornered Sling for several years. Marine aviation assets have also not taken part in Commando Slings since 2008. In recent years Commando Sling exercises have been scaled back gradually with only three iterations conducted during FY2011, all involving the USAF's Pacific Air Forces units. This was in contrast to their heyday in the late 1990s when up to six Slings happened annually. Although the exercises also mostly involved Pacific Command units, CONUS-based F-15 and F-16 units of the USAF, Air National Guard (ANG) and even Air Force Reserve Command (AFRC) and Air Education and Training Command (AETC) were also a regular sight in Singapore's skies, making the long trip to Paya Lebar to train with the RSAF. With the recent drawdown in American forces from the wars in Iraq and Afghanistan, coupled with regional tensions involving China and an increased American force posture in the Asia-Pacific region, there is every likelihood that regional exercises involving American forces such as Commando Sling may increase in scope.